Day 1; Zagreb, Arrival Day The adventure begins in Zagreb, Croatia’s vibrant capital. Upon arrival, hotel check-in. Afternoon at leisure. Day 2; Zagreb No better way to kick of a tour of Croatia’s highlights than a guided walking tour of the capital city. Guests join our expert local guide on a city discovery tour including Zagreb Upper Town, Lotrscak Tower, St. Mark’s Square, Parliament Building, Stone Gate, Strossmayer Promenade and more city sites. Afternoon is at leisure, offering the travelers an opportunity to seek out activities that best suit their interests. Day 3; Plitvice Lakes National Park - Zadar Today the tour departs Zagreb in the morning to drive Plitvice Lakes National Park, a UNESCO site and most popular national park in the country. Spend the morning on a guided walking tour of the park including a lake boat ride. The tour continues to Zadar, with an en route stop at the famous Maraschino cherries plantation for a tour and tasting. Upon arrival to Zadar, travelers are led on a guided walking tour of the historic center, including ancient Roman sites, vibrant cobbled alleys, and stunning coastal front known to have the most beautiful sunset in the world. Day 4; Sibenik -Trogir - Split This day starts with a short drive from Zadar to Sibenik where a guided walking tour through the old part of the town unveils sites such as the UNESCO protected Cathedral of St. James, one of the most important sacral monuments in Dalmatia. Afterwards, the journey continues to Trogir. This UNESCO protected city-isle fascinates with a mix of ancient architecture, historical sites and trendy shops. Travelers get to explore Trogir on their own, before ending their day in the nearby Split. 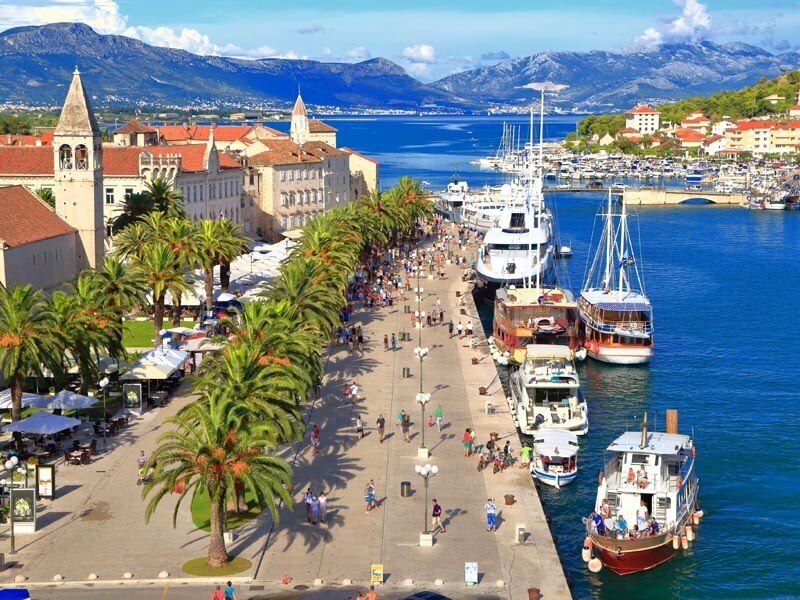 Day 5; Split Half through this journey, guests will spend a day exploring Split, the historic center of Dalmatia region. A guided walking tour includes Diocletian’s Palace, the historic core of the city, Roman monuments, sacral sites, the popular Riva and Split’s always vibrant narrow alleys lined with boutiques, restaurants and coffee bars. Afternoon at leisure. Day 6; Split A day reserved for travelers to enjoy their time in Split at their own pace and interest. Guests can opt to relax on a local beach, explore Split on their own or add some of our optional tours like guided tours to nearby islands or an adventurous day on Krka or Cetina Rivers. Day 7; Split - Mostar - Dubrovnik This morning depart Split and drive to Mostar, home to the most famous bridge on the Balkan Peninsula, the Old Bridge. Travelers will discover layers of history of this spectacular city and a UNESCO site on a guided walking tour. Afterwards depart Mostar and drive to Dubrovnik. Day 8; Dubrovnik This day will start with expertly guided walking tour of Dubrovnik’s Old Town, a UNESCO site and Croatia’s most famous seaside resort. Travelers get to learn about Dubrovnik’s intriguing history, epic battles, most beautiful monuments and even some favorite local spots. Rest of the day is at leisure, with plenty time to wander through narrow streets in Old Town, and discover most beautiful local beaches. Day 9; Dubrovnik The last day on the tour is at leisure. Travelers can opt to explore Dubrovnik and nearby islands on their own, relax on some of the local beaches or opt for one of our optional local or Montenegro tours. Day 10; Departure Transfer to Dubrovnik Airport for flights back home.